Hop aroma is big on this beer, with citrus aromas dominating. Medium malt body is balanced by a deep hop flavour, finishing clean with not too much bitterness. 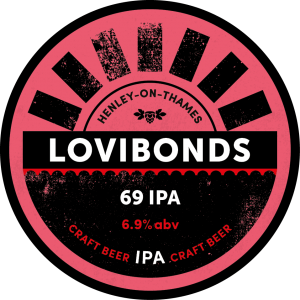 Lovibonds 69 IPA is not a boring, middle of the road IPA. We’re not quite sure how British IPAs evolved into such low gravity pints of hop-lessness. 69 IPA is part of a new generation of IPAs, one that fuses the great history of IPA with modern hops and techniques. You may not be aware, but craft brewers in the States are now producing some of the most remarkable, flavoursome and diverse beers in the world. IPA is a style that they have embraced with vigour and 69 IPA is a nod to our brothers and sisters across the pond, who serve as a guide and inspiration for this beer. At 6.9% abv, our IPA has the strength of an original IPA, but is infused with the modern aromas and flavours of the USA’s finest hops. Rich golden colour with creamy head. The intensity of this beer can be paired with other intensely flavoured cheeses such as a very sharp cheddar. How about pairing with the bold flavours of your favourite Indian food. The carbonation can also be used to cleanse the palate of fatty dishes. Can also be used as an aperitif as the large amount of hop flavour will stimulate the appetite. British Pale Lager Malt, Wheat Malt, Cara and Acid Malt.